OPI's new valentine to your nails takes a high-tech twist with the new e-Romance collection. If the adoreable cardboard laptop display at your local salon or beauty supply doesn't draw you in, the cutesy names will. 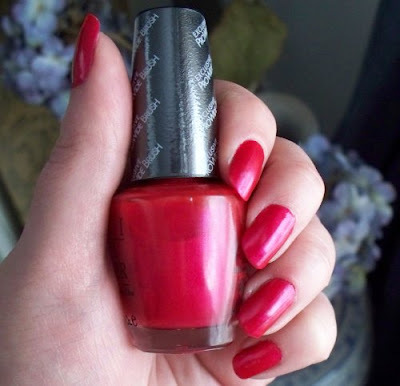 Log in to Love has a classic red shimmer finish. Text Me - Text You is a versatile sheer, holographic top coat that is getting the most buzz for its ability to transform other dark colors with a sparse prismatic twinkle. However, the one I found the most irresistible is Met on the Internet, which is a shimmery bright pink. Your nails look beautiful, Melanie! I love all three of these e-romance colors. I caved on them all! ps have you tried any of the new Borghese yet? Venetian Red is gorgeous! I love their nail collection themes - this one is almost as funny as the Divorcee collection, LOL! This collection sounds so fun! They are always so clever with their themes :) I like the red on your nails although I prefer deeper shades on myself. Wow! It looks good when it on your nail. Nice color. I like that. Nope, Patti. I still haven't tried the Borghese polishes yet. There is something about not getting anything at Walgreen's for full price... I am waiting for a BOGO. The bottles are really nice, but all of the colors reminded me of something I already have. But given a sale, I will surely cave on them.